We found 4 episodes of Teaching Python with the tag “education”. With their school's Innovation Institute coming up, Kelly and Sean explore the topic of innovation in education. How do you cultivate it in yourself and others? What skills help you become more innovative? How do you teach it? Co-hosts Kelly and Sean discuss their top eight methods for building resilience in students. Whether you call it grit, perseverance, persistence, determination, or something else, it's important to help students get through the hard and often frustrating moments of learning a new language so that they can become self-sufficient. Kelly and Sean discuss the importance of the 'click' when learning Python and identify strategies for encouraging a state of flow in classrooms. What is the click moment? How do you know when flow is achieved? Our very first episode! 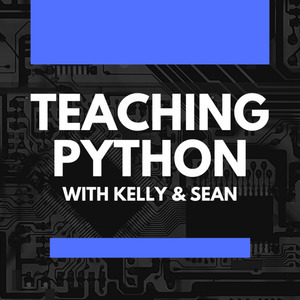 Kelly and Sean talk about how to get started teaching Python, including how to set up a room for computer science, what books and podcasts were most useful, the joys of Tynker, and how to set your own expectations for how to teach Python for others.